While there is a plethora of browser-based photo editors available, only a few seems to get through the cut for advance users looking for alternatives to the famous Lightroom and the retired Aperture. 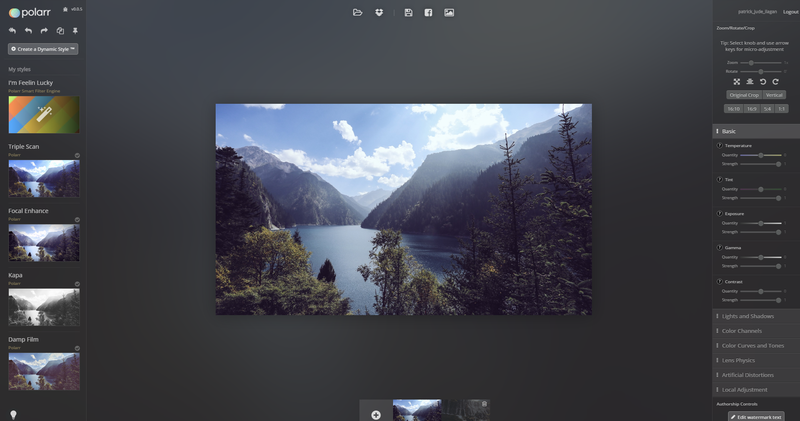 Meet Polarr, a browser-based photo editor that is currently on it’s open beta stage and is being developed further by a young team of hackers and photographers. Aimed for advance photography enthusiasts,Polarr sports a great array of editing tools and resources to efficiently edit images within the browser. For someone who heavily uses Lightroom for editing and cataloging photos, I find Polarr easy to use without having to go through the proverbial and not to mention exhausting learning curve to find where is which and what does what. In fact the user-interface and experience of Polarr is not too faraway from Adobe Lightroom at some point it feels as if you are still using Lightroom just without the catalog option. Make no mistake, Polarr is not a copy of Lightroom which was fitted in a browser to help the advance and constantly mobile photographers. Polarr is a league of it’s own with it’s ability to learn one’s style and taste through an “intelligent processing engine”. With automated options based from the user’s taste readily available, Polarr hopes that the feature would help cut down the time spent post-processing and allow the photographer to shoot more. Importing is easy, one can just drag and drop or just sign in their Dropbox account and import or have it synced the photos from there. As of this writing, Polarr can only work with high resolution JPEGs and PNGs up to 30 megapixels. The toolbar is divided into seven categories namely: Basic, Lights and Shadows, Color Channels, Color Curves and Tones, Lens Physics, Artificial Distortions and Local Adjustment. Polarr also features styles which are basically filters but what’s interesting is the Dynamic Styles function. Essentially, Dynamic Styles are smart presets that can be created and be save under a preferred name. But unlike regular presets that copies the whole setting of an image, Dynamic Styles are intelligently applied depending on the photograph. The developers behind Polarr strongly recommend users to use Chrome for it’s fast integration with the current web standards. Apart from the browser based application, users can also download an app from the Google Web Store. Anyone can join the beta users either by signing up through email or through Facebook. Do check out the official Tumblr blog to learn more about Polarr or follow them on Facebook.